This International Corn Sheller was another Trade Me find. There have been others pop up but not many. From the far North of NZ. 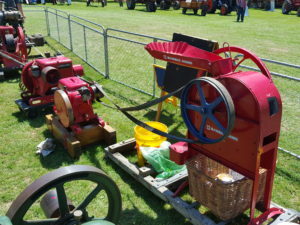 This was restored by Dad and has proven to be a lot of fun to display at shows. A fun use has been to put popcorn cobs through it then the kernels into a popcorn maker then given away as a snack! I lent the machine to Lincoln College as they had popcorn to process. Here is a video of it in action. Cant believe they did it all by hand.